The 2017 AFL fixture was released today and of course, our thoughts go straight to thinking about Fantasy. There are a few points that will have an affect on how we play the game in the new year. Here are my initial thoughts. Click here for the full fixture. The three multi-bye rounds are back and in 2017, they will be played across rounds 11, 12 and 13. Last year they occurred over 13, 14 and 15 meaning, for some coaches, a lot of upgrades had been done in the salary cap game. As has been common practice, the best 18 scores will count over each of the three rounds. Round 13 could be a challenge on first impression, as there will be a few popular premium players from the spread of teams there. Sydney midfielders will be among the popular inclusions coming out of their round 11 bye. On another note, a cheap Stefan Martin and premium Max Gawn ruck combo may not be great with both having the first bye. Plenty to think about in our pre-season planning. Note that there are only four teams on a bye in round 12… that is because in round eight, Gold Coast will host Port Adelaide in China and their bye will be the week following the match. 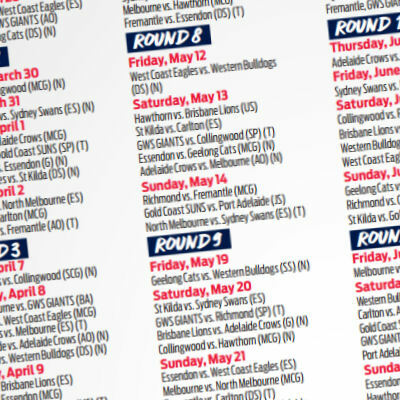 Therefore, round nine will be a bye round as well with eight games being played. How many trades should we have for the bye rounds? Leave it as the two that we get every week. Bump it up to three. As mentioned above, Port Adelaide and Gold Coast will play in Shanghai in round eight and they will have their in-season bye earlier than the rest of the competition in round nine. What will it mean for Fantasy? With players from the two teams on the bye getting zeroes, then there will be some thought required here. Round nine could possibly be treated as a multi-bye round and therefore, the best 18 could be in place. The question around this is that it could be too easy on this round. Alternatively, it could just be left as normal and you use your two trades to move out any Power or Suns players (or bench them). This would also mean that you are less likely to start with them. In saying that, Port Adelaide and Gold Coast players will be popular to have rolling through your team following the bye as they will be playing in each of the three multi-bye rounds. Something to think about. In Elite, most leagues have the bye rounds turned off (ie. don’t play head-to-head league games), but you would think that round nine would be treated as normal. Does that mean you wouldn’t draft Gary Ablett as high? There are a few relevant players worth looking at to come in that week. Post your thoughts on what AFL Fantasy could do in the comments. With every Thursday night game, we have a partial lockout. In 2017 we will have eight, up from five this season. Main reason being is that Easter is later and with the Port Adelaide and Gold Coast bye, more can be fitted around the whole six day break thing. Premium Port Adelaide players could be handy for the Captain loophole following their round nine by with back-to-back Thursday night games. The Cats and Hawks also have two Thursday night games in the five week stretch of the earlier round starts. It’s not generally too much of an issue, but there comes some risk – and stress – when we have games starting after Sunday night as we don’t know finalised 22s. There are a couple of these through the year of which you need to be aware. The floating fixture is still in place for the final round of the season. This is strange considering there is still a week off between round 23 and the first week of the finals. Anyway, this is likely to remain as the Fantasy Grand Final weekend but what could throw a spanner in the works is Travis Auld said on the fixture announcement broadcast on AFL.com.au is that there could be a Monday night game. This would mean out Grand Finals would finish on a Monday evening and we wouldn’t know final teams on the Friday night before lockout. Coupled with not knowing the dates/times of the final round until around a month before it happens, then it could be very interesting. I think if we went with best 18, it could be ‘too easy’ for that week. I am in the leave it as it is camp. We have two trades to help fix our teams. It’s another ‘strategy’. If that is the case, I will avoid most Port or GC players to begin with… depending on prices, etc. Also, what do people think about bumping to three trades for the MBRs? I am happy with the simplicity of two trades per week coupled with the fact we get two trades every week of the season unlike other salary cap games, but interested in seeing what others think. I think leave it as is, its only 2 teams adds another spin on the season. 2 trades is fine we dont want to make it to easy! Is it just me or is giving coaches the average score for Port/Suns players during the Round 9 bye not the best way to go about it? People might start with a few more of them but it strikes me as the most efficient (and least disruptive) solution. I don’t like it as it’s their ‘bye’ – ie. it’s not an extra one. I agree on that but if it is just left as is then it makes it a lot tougher to justify picking players on those two teams which I think would be worse for the game than essentially nullifying their bye. Since during the normal bye rounds there are 6 teams missing and only best 18 scores count, maybe with 2 teams missing then only best 20/21 scores should count? I don’t like another variable (22 players most weeks, 18 during byes then 20/21 on another week). So, I think it would be the 22 or 18. If it is left as it is, then I won’t pick many (if any) players from Port or the Suns… however, there are probably only a couple I would consider anyway! Haha. And no way to three trades, makes it way too easy as bye rounds are where the better players plot their push up the rankings. Cheers mate. I’m not sure teams were too similar. I feel it is a myth that the two trades per week make teams similar. There was even some data (sorry, I can’t think where that was) that showed SC and RDT teams were more similar than AFL Fantasy Classic teams. But, I agree. I don’t think we need to have 3 trades for the bye rounds. Great stuff Warnie. Overall I like the fixture. I especially like that Max Gawn, Brodie Grundy and Todd Goldstein all have different byes. There’s also the possibility of loading up on Sandilands/Bellchambers/Vardy in the rucks and trading them out before their bye. I’m not liking Round 11 for Defenders, with Simpson, Docherty, all the Bulldogs boys, Hibberd, and potentially some Saints/Lions players all out, it could be carnage. Overall though, I think the byes are better than last year. They’ll certainly be easier to navigate. We just need Gold Coast and Port to hold back their rookies until Round 10 so that we have some good ones coming through to downgrade to. Good stuff Warnie. I’m already staring pre-season 2017. I look forward to more content in the coming months as we learn more about how things will run next year. Best 18 for Rounds 11-13 imo and Best 22 for R9 imo. The inconvenience of the Suns Power bye in R9 would be balanced by an easier week in R12. Could make it 44 trades a season, with a maximum of 2 trades per week except the byes when you can have 3, this means that if you choose to trade 3 in the byes, you take a penalty at some point later on by only having 1 trade in a week. I will be selecting my Round 1 team based on Merrett; that guy’s a gun. He should be even better this year with all his teammates back. Priced at an average of 119 though? Personally I’m far more interested in Heppell. I don’t think you can start with Merrett based on unknown. He will most likely be MID only as well. Is Stefan and Gawn having the bye in the same round really an issue at all? I believe that due to the fluid structure of the scoring for bye rounds, as long as your team as a whole is balanced then positions don’t matter. Yeah, agree. I guess it will come down to how well you have structured your team for the byes and the spread of players across them. It shouldn’t be too much of an issue. Is Max more of a post-bye upgrade target due to having the first bye? Potentially, but not going with Gawn leaves you with either Grundy, Goldy, a mid-pricer, or a rookie. Paying too much for Goldy and Grundy, I don’t like any mid-pricers, and rookie options in the ruck are not good news. Is it possible to put too much emphasis on when players have the bye when making these decisions? We didn’t put a heap on last year with byes later. They’re a touch earlier, with an extra quirk, so we need to look at them a bit. Obviously we will have to give a thought to PA and GC players – depending on the game rules. Looking forward to the challenge once we see the prices! About six weeks away! That is very exciting, can’t wait. I think you should be able to do 2 transfers a week except if you want to you can save a transfer so you can use that transfer the next week so you can have 3 the next week which will be helpful for bye rounds or rounds with key injuries. hi Guys, Warnie or others , is the >100 and >100 against the number or players in the team each week that either scored over 100, or had over 100 scored against them, is that correct?